How does GPS Accuracy affect Lake Mapping Results? When thinking about mapping a lake, it’s good to have a basic background of how the different methods of GPS can affect the quality of your data and ultimately the accuracy of your map. Staff at The Mapping Network have been using GPS technology to map lakes since the 1990’s and we want to quickly cover some basics about the primary GPS collection methods available today. It is important to understand how each type of GPS system will greatly influence the end result. We are not going in depth on the theory and history of GPS but rather show simple examples of how accuracy on the initial data collection side is critical to creating an accurate map. Diagram showing typical accuracy using standard hand held GPS (in blue), WAAS (yellow), Differential GPS (red). In this example one point was collected inside the red circle. Based on accuracy ratings for the standard GPS we would expect the point to be placed somewhere in the blue circle. If using WAAS it should land somewhere in the yellow circle and if using Differential GPS it should be near the red circle. Global positioning system (GPS) is a satellite navigation system developed in the early 1970s by the Department of Defense to overcome certain obstacles in navigation. Since then, the GPS navigation system has made its way to the public in the mid to late 1990s. Over the past decade, the accuracy of GPS has greatly increased in part from introducing new, more accurate satellites along with more sophisticated hardware and software for the ground units themselves. GPS computes its position based on time. This distance is computed based on the speed of light distance between the satellite and the receiver. The result is a z,y,z location on the earth. Typical hand held GPS units without extra enhancements can be anywhere from 10 to 30 meters with regards to locational horizontal accuracy. Wide Area Augmentation System (WAAS) is a navigation system developed by the Federal Aviation Administration (FAA) to enhance the accuracy of GPS units onboard aircraft. WAAS uses ground based reference stations located around the Western Hemisphere to measure small variations in the GPS satellite messages. 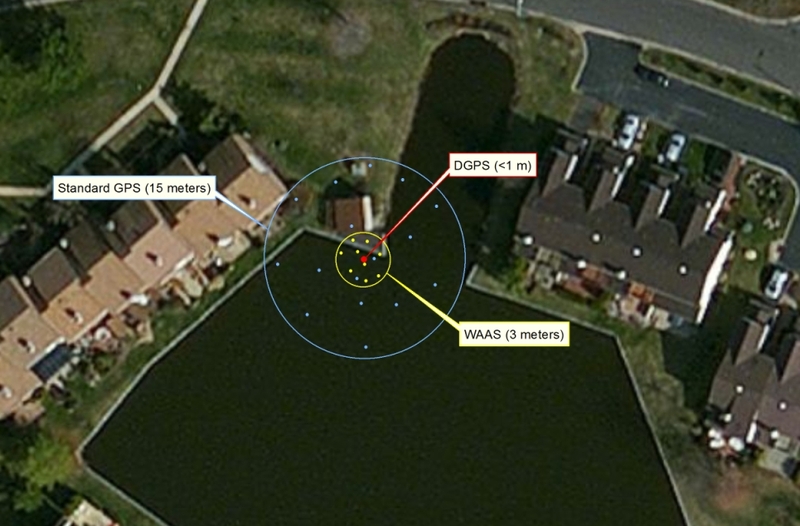 The typical horizontal accuracy of WAAS is within 3-7 meters to the user according to the FAA website. The level of accuracy will be affected by the type of hardware and software being used to receive the signal. WAAS navigation system is only available in North America. Differential GPS helps fix errors with basic GPS mapping. This works by determining the inaccuracy from the GPS by comparing the locations of a stationary receiver location and a known location. Since the location of the DGPS is known, it’s able to send out a transmission to all DGPS equipped receivers near the area with the correct radio signal transmission. Using professional grade equipment this is typically accurate to 50 cm horizontal real-time and up to 10 cm by post processing. Real Time Kinematic (RTK) system navigation is the most accurate option for mapping. RTK is capable of providing accuracies to within a centimeter both horizontally and vertically. RTK is mostly used for land surveying and land topography services because it is very accurate for capturing x,y,z (Lat, Long and Elevation). How Does This Affect the Lake Map? Creating contour maps starts with collecting data points throughout the lake. These points then create a 3D model of the lake bottom where a number of different types of analyses can be performed. In regard to locational accuracy, if we collect a single point on the lake, the point we are collecting will have a x, y (latitude and longitude provided by GPS). If we are using a standard handheld unit that point is probably going to fall anywhere within a 15 meter radius. Now let’s say we are using a WAAS enabled GPS system like what is found on the Lowrance HDS unit. In this case we should expect the point to fall within a 3-4 meter radius of the actual location. Look at the illustration above to better visualize what this means for accuracy. If the water depth was 3.5 ft deep at the point collected you right away see where using a handheld unit or even a WAAS enabled unit can present all sorts of issues. The 3.5 ft depth could be on land or still be in the water but 3 meters off. The typical software used to process the data will then have to greatly generalize the contour map. This type of mapping can be valuable for general recreation uses or quick management calculations but will be based off of a general estimate and would not be useful for information where accuracy is needed. So how do we go about collecting accurate data? According to the US Army Corps of Engineers specs the GPS location needs to be sub meter accurate. This means using the correct Differential GPS or RTK system will achieve the locational accuracy required to generate an accurate map. We understand there are different levels of needs for various clients and many times using a WAAS system will provide enough information to the client. We call these recreational grade maps where general contours and depths can be seen and should be used as general reference maps. These maps can look nice from a visual standpoint but provide little quantitative value. Most projects require a certain level of accuracy that we call professional grade maps. These maps can be used to generate accurate water volume, sedimentation rates, dredging or excavation planning and verification. The Mapping Network provides the consumer with different accuracy levels based on the needs of the project. It is very important to understand the different types of data collection because it is a critical component to a successful lake map. As is with anything else in life, you get what you pay for! This entry was posted in Lake Map, News, Sediment and tagged Absolute Natural Resources, aerial lake map, Allied Biological, Aquatechnex, Aquatic Environmental Services, Bathymetric Map, Bathymetry, dredge map for lake, Dredging, Fishing, fishing map contours, foster lake management, Georgia Lake Map, GPS, GPS accuracy, GPS Lake, GPS Map, hydrographic survey, hydrography, Lake and Pond Connection, Lake Management, Lake Map, Lake Mapping, lake of the ozarks map, Lake Survey, Leisure Ponds, Lowrance HDS, make a lake map, New Jersey lake map, Pond Medics, Quality Lakes, Sediment, Sedimentation, Solitude Lake Management, south carolina lake map, southeastern pond management, Survey, Texas Lake Map, The Mapping Network, WAAS, WAAS lake map on August 15, 2013 by Moderator. This entry was posted in Lake Map, News, Sediment and tagged Absolute Natural Resources, aerial lake map, Allied Biological, Aquatechnex, Aquatic Environmental Services, Bathymetric Map, Bathymetry, dredge map for lake, Dredging, Fishing, fishing map contours, foster lake management, Georgia Lake Map, GPS, GPS accuracy, GPS Lake, GPS Map, hydrographic survey, hydrography, Lake and Pond Connection, Lake Management, Lake Map, Lake Mapping, lake of the ozarks map, Lake Survey, Leisure Ponds, Lowrance HDS, make a lake map, New Jersey lake map, Pond Medics, Quality Lakes, Sediment, Sedimentation, Solitude Lake Management, south carolina lake map, southeastern pond management, Survey, Texas Lake Map, The Mapping Network, WAAS, WAAS lake map on February 6, 2013 by Moderator. This entry was posted in Lake Map, News, Sediment and tagged Absolute Natural Resources, aerial lake map, Allied Biological, Aquatechnex, Aquatic Environmental Services, Bathymetric Map, Bathymetry, dredge map for lake, Dredging, Fishing, fishing map contours, foster lake management, Georgia Lake Map, GPS, GPS accuracy, GPS Lake, GPS Map, hydrographic survey, hydrography, Lake and Pond Connection, Lake Management, Lake Map, Lake Mapping, lake of the ozarks map, Lake Survey, Leisure Ponds, Lowrance HDS, make a lake map, New Jersey lake map, Pond Medics, Quality Lakes, Sediment, Sedimentation, Solitude Lake Management, south carolina lake map, southeastern pond management, Survey, Texas Lake Map, The Mapping Network, WAAS, WAAS lake map on November 1, 2012 by Moderator. This entry was posted in Lake Map, News, Sediment and tagged Absolute Natural Resources, aerial lake map, Allied Biological, Aquatechnex, Aquatic Environmental Services, Bathymetric Map, Bathymetry, dredge map for lake, Dredging, Fishing, fishing map contours, foster lake management, Georgia Lake Map, GPS, GPS accuracy, GPS Lake, GPS Map, hydrographic survey, hydrography, Lake and Pond Connection, Lake Management, Lake Map, Lake Mapping, lake of the ozarks map, Lake Survey, Leisure Ponds, Lowrance HDS, make a lake map, New Jersey lake map, Pond Medics, Quality Lakes, Sediment, Sedimentation, Solitude Lake Management, south carolina lake map, southeastern pond management, Survey, Texas Lake Map, The Mapping Network, WAAS, WAAS lake map on September 10, 2012 by Moderator. This entry was posted in Lake Map, News, Sediment and tagged Absolute Natural Resources, aerial lake map, Allied Biological, Aquatechnex, Aquatic Environmental Services, Bathymetric Map, Bathymetry, dredge map for lake, Dredging, Fishing, fishing map contours, foster lake management, Georgia Lake Map, GPS, GPS accuracy, GPS Lake, GPS Map, hydrographic survey, hydrography, Lake and Pond Connection, Lake Management, Lake Map, Lake Mapping, lake of the ozarks map, Lake Survey, Leisure Ponds, Lowrance HDS, make a lake map, New Jersey lake map, Pond Medics, Quality Lakes, Sediment, Sedimentation, Solitude Lake Management, south carolina lake map, southeastern pond management, Survey, Texas Lake Map, The Mapping Network, WAAS, WAAS lake map on August 3, 2012 by Moderator. This entry was posted in Lake Map, News, Sediment and tagged Absolute Natural Resources, aerial lake map, Allied Biological, Aquatechnex, Aquatic Environmental Services, Bathymetric Map, Bathymetry, dredge map for lake, Dredging, Fishing, fishing map contours, foster lake management, Georgia Lake Map, GPS, GPS accuracy, GPS Lake, GPS Map, hydrographic survey, hydrography, Lake and Pond Connection, Lake Management, Lake Map, Lake Mapping, lake of the ozarks map, Lake Survey, Leisure Ponds, Lowrance HDS, make a lake map, New Jersey lake map, Pond Medics, Quality Lakes, Sediment, Sedimentation, Solitude Lake Management, south carolina lake map, southeastern pond management, Survey, Texas Lake Map, The Mapping Network, WAAS, WAAS lake map on July 25, 2012 by Moderator.